Homemade Snap Pea Crisps - A Spicy, Cheesy & Healthy Snack! Homemade Snap Pea Crisps - A Spicy, Cheesy & Healthy Snack! These homemade snap pea crisps are super simple to make in a dehydrator. 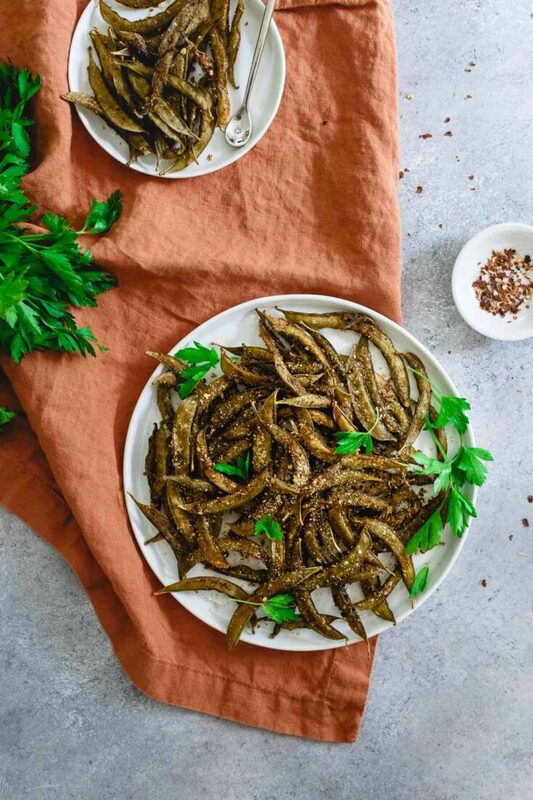 They’re seasoned with spices and nutritional yeast for a tasty healthy snack that rivals the store bought kind. I’ve been quite “snacky” lately. Literally, I could just sit and graze on small bites pretty much all day long and never eat a full meal. I don’t really know what’s going on but it’s one of those times I kinda wish I worked outside of the house so that wasn’t even a possibility. But, when you spend 90% of your waking hours either in your kitchen or on the couch, 5 steps from the kitchen, snacking all day IS a possibility. 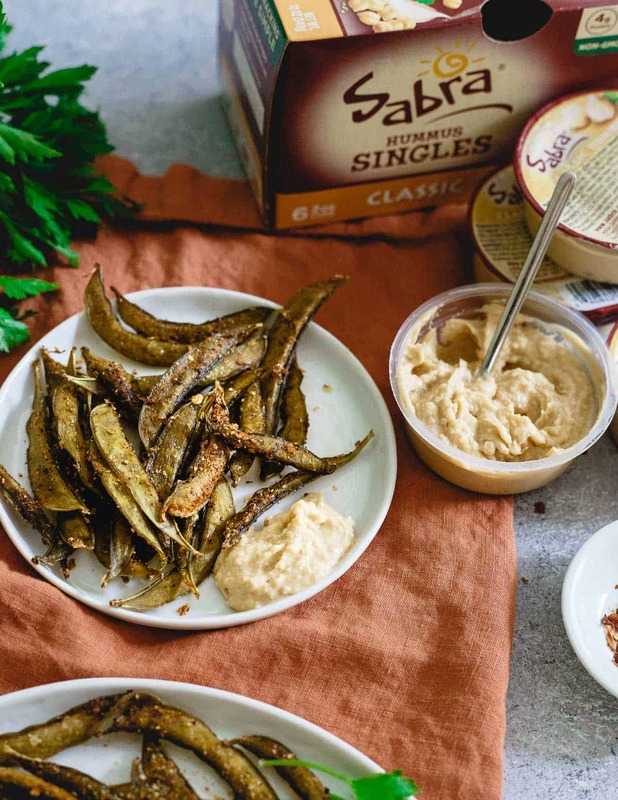 *This recipe for spicy homemade snap pea crisps is sponsored by Sabra. All content and opinions are my own. For as much healthy stuff as there is in my house to eat, I seem to always find that bag of chocolate chips, coconut crusted cashews (<–heyyyy, Trader Joes obsession) or, that bag of marshmallows that’s supposed to be for fire pit s’mores on the patio. Oops. I justify this daytime snack by calling it workout “fuel” since I’m usually headed to the gym right after the pantry debauchery goes down. When I get home from the gym and it’s time to prep dinner, I’m usually better about things. I grab a container of Sabra hummus (I love the singles for built in portion control! ), scrounge around in the vegetable drawer for a carrot or celery and promptly commence with the #UnofficialMeal (<– Sabra’s fancy phrase for the pre-dinner snack we all know and do so well). Sick of the usual baby carrots and boring celery though, I decided to steal Brandy’s dehydrator (I swear I use the thing more than her, case in point – eggplant chips, buffalo sauce beef jerky and lamb jerky and might just keep it this time) and dehydrated the hell out of some snap peas. I figured if they could sell these as a packaged snack these days, I could easily make them, right? And hey, guess what? They’re pretty freakin’ delicious. You know what you don’t feel bad about eating 1.5 pounds of before dinner? Check out my guide to peas for more on this delicious spring vegetable! Can’t say that about chocolate, cashews and marshmallows can you? The possibilities with these homemade snap pea crisps are endless when it comes to seasonings but I went with a spicy, “cheesy” approach. There’s the savory garlic and onion powder undertone with some chili powder and cayenne for spice and a good dose of nutritional yeast for that cheesy flavor that’s not really cheese. Nutritional yeast keeps these vegan friendly but grated parmesan would be an awesome choice too if you want real cheese flavor. I’ve pretty much given up hope for the afternoon snack staying on the healthy side but I’m down to make the pre-dinner one a bit more nutritious with these snap pea crisps and some hummus! 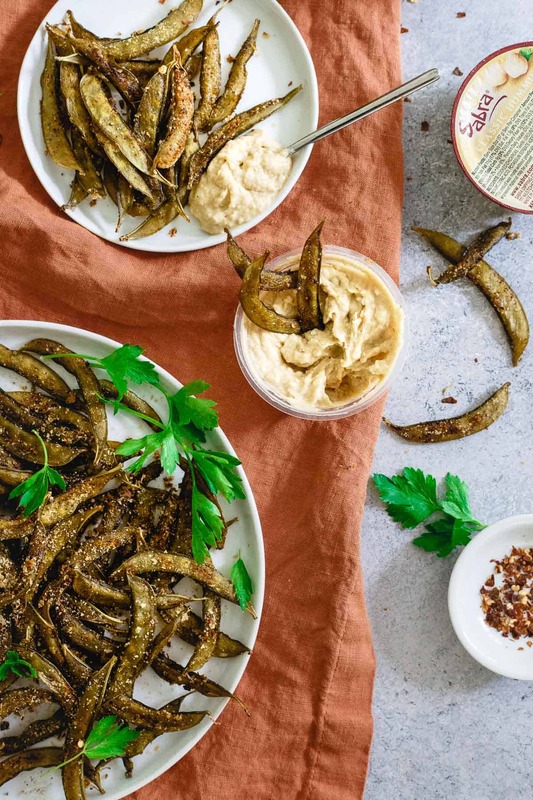 Love this homemade snap pea crisps recipe? Check out my Spicy Seasoned Pretzels, Pizza Kale Chips, Plantain chips and salsa and Rosemary Sea Salt and Vinegar Beet Chips too! 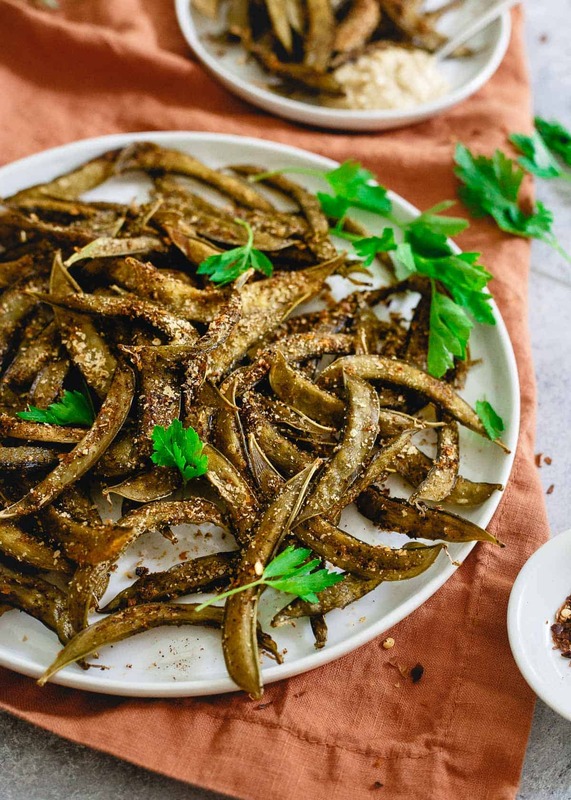 These homemade snap pea crisps are super simple to make in a dehydrator. They're seasoned with spices and nutritional yeast for a tasty healthy snack that rival the store bought kind. Lay snap peas out on a baking sheet in a single layer. Drizzle with olive oil then season with remaining spices. Toss lightly until the snap peas are evenly coated with the olive oil and seasonings. Place the snap peas in a dehydrator (see note below for the dehydrator I use) making sure to not crowd the racks. Dehydrate at 135 degrees F for about 8 hours or until dried and crispy (I started checking around the 6 hour mark but wanted them nice and crisp which was around 8 hours for me). Let stand for at least 30 minutes after dehydrator is turned off before packaging for storage. What. These look so freaking addicting!!! Okay, it’s time for me to finally get a dehydrator. I never would have thought to make homemade pea crisps. Sabra is the best – total match made in heaven with those crisps. I would down a huge bowl of this snack in 5 minutes flat! This is kind of snack! They definitely would last long around my house. Snacking is dangerous for me too Gina! But these look like the perfect healthy snack. I’ve been meaning to get a dehydrator for other things too. Thanks for sharing the link for yours. These are the ULTIMATE snack-age! I can’t wait to down them ALL dipped in ALL the Sabra! These sound and look so good! Loving this healthy snack! These look so tasty! Great for dipping in Sabra! It’s time for me to break out my dehydrator thats been in hibernation for a few years! 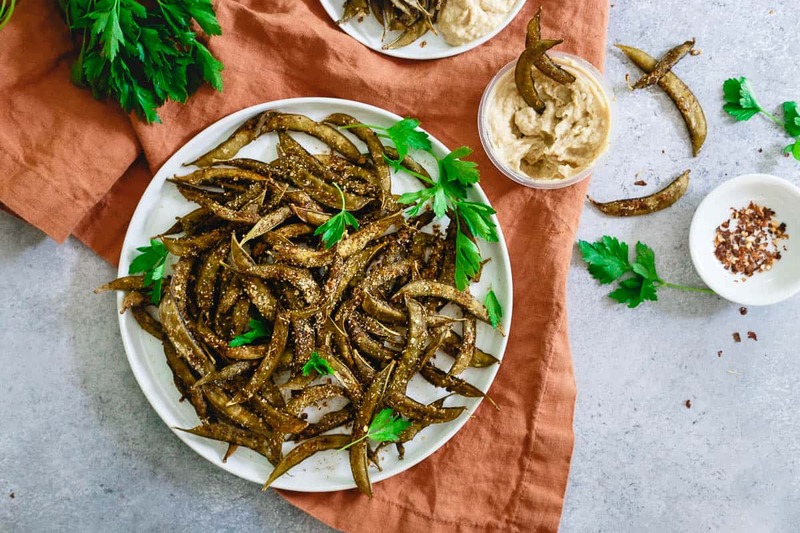 I’m obsessed with crispy veggies, and these would satisfy my cravings in a pinch! This is genius!!! Can’t wait to try the homemade snap pea crisps! I bet these are so much healthier – and yummier – than the bagged kind! What a great snack idea!! LOVE! Why have I never thought to dehydrate veggies at home?! You’re a genius! Can you provide a non-dehydrator option? I’d love to make these but don’t have one and not planning on getting one. I haven’t tried them in the oven, I’ve only used the dehydrator so I can’t attest to the results of anything in the oven. You could try it on the lowest temperature your oven goes (mine is 175) and check around 4-5 hours. You’ll probably have to flip them a few times to crisp up evenly.